This pattern is part of Coop Knits Socks - the printed book is available here. Every print book will contain a code to enable you to download the eBook free of charge. 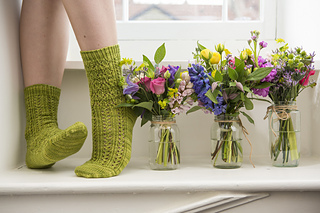 Leafy lace and wrapped stitch patterns entwine these socks. Designed to be odd, the leg and foot of each sock are opposites.